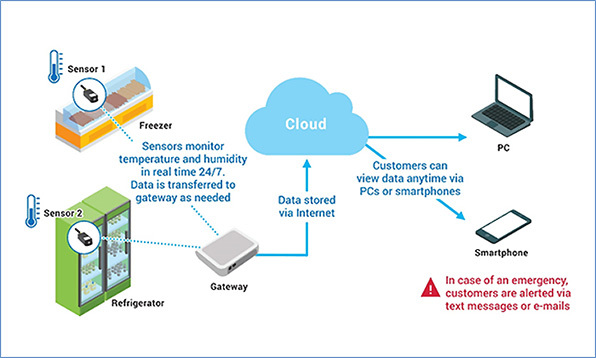 TOKYO, JAPAN, October 22, 2018 --- NTT DOCOMO, INC. and NTT DOCOMO USA, Inc. announced today the immediate launch of an IoT-driven temperature- and humidity-monitoring service for industrial refrigerators and freezers in the United States. Customers can use smartphones or PCs to monitor the temperature and humidity of their equipment, get alerts in the event of any abnormality, receive monthly reports on temperature and humidity trends, and change settings based on such reports. The subscription service is available from $99 per month in the United States. DOCOMO developed the service in collaboration with myDevices, an IoT solutions company based in Los Angeles, California that provides IoT technology based on LoRa®, a wireless data communication technology for low-power, extra-long-range transmissions. Temperature and humidity data collected at grocery stores and restaurants are available in the cloud in real time for reliable temperature management, including efficient automation of processes such as visual confirmations by employees, and reduced food wastage. The system uses the LoRaWANTM specification, a low-power, wide area networking protocol introduced by the LoRa AllianceTM, which enables sensors to run for more than five years without replacement. The new service has been launched under DOCOMO's "GlobiotTM" global IoT initiative, which was introduced on July 2 to provide global connectivity and operational support and consulting to Japanese enterprises that have global IoT operations. Going forward, DOCOMO and DOCOMO USA expect to continue collaborating with cutting-edge U.S. companies to introduce additional IoT solutions that help customers raise their productivity and create new value. "LoRa", "LoRaWAN" and "LoRa Alliance" are trademarks or registered trademarks of Semtech Corporation. "Globiot" is a trademark of NTT DOCOMO, INC.
NTT DOCOMO USA is the U.S. subsidiary of NTT DOCOMO. We are now developing a communications business beginning with mobile solutions in the United States, primarily enterprise-facing solutions. By utilizing the vast global experience of the NTT Group and collaborating with our partner companies in a variety of different fields, we aim to deliver the highest quality services to our customers.